Workflows don't have to be complex to get the job done. But even flows with only 10 actors already help documenting your work, preserving all steps in volved in generating the results. These flows are a good introduction into the many actors that ADAMS already has on offer. Absolute simple flow that merely displays the Hello World string. Cross-validates a classifier (J48) on a single UCI dataset. 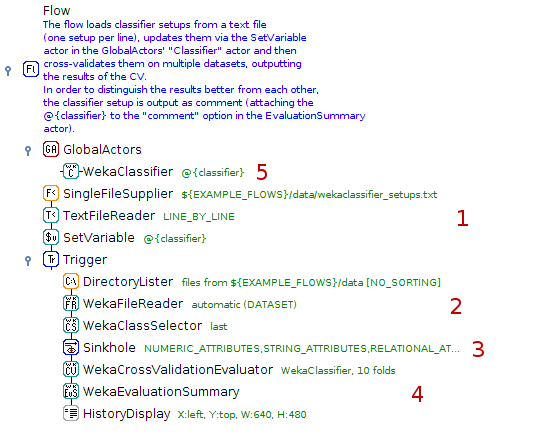 Reads in set ups of WEKA classifiers stored in a text file and evaluates each against all datasets in a directory. Adds datasets located in a directory to a pre-defined WEKA experiment, runs the experiment and displays the evaluation. 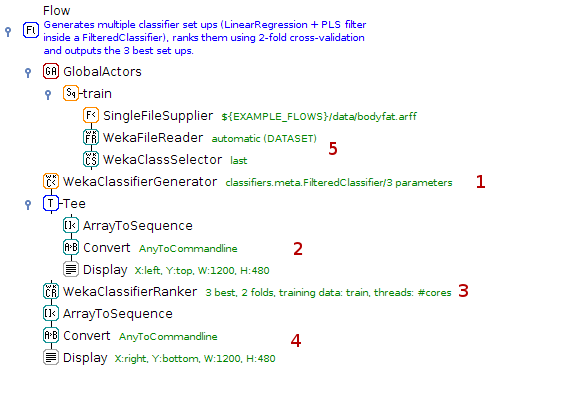 Generates a parameter sweep for multiple parameters of WEKA classifiers, ranks these using 2-fold cross-validation and subjects the top 3 to a proper evaluation.